The Riverdale Trailer Debuted at The CW Upfronts Today. Here's Our Description. 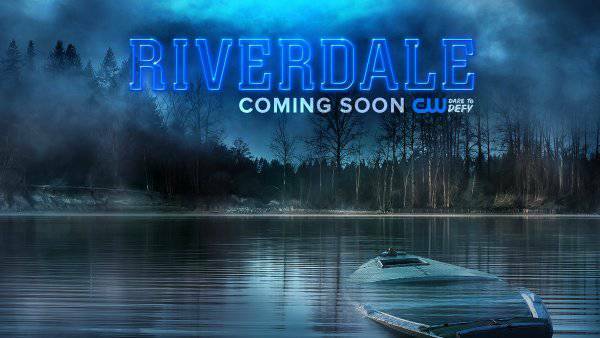 Moments ago, The CW provided members of the press with their frist look at Riverdale, the forthcoming series set in the world of Archie Comics and expected to debut in early 2017 on the network. They showed it onstage at their upfront presentation, but it hasn't yet been released online. Lucky for you, ComicBook.com's Lucas Siegel is onhand at the upfronts in New York to share a description of the trailer. "This story is about a town, a small town, sweet, innocent. But if you look close enough you start to see the shadows underneath the town and sometimes the shadows take over." There's a murder, and one couple says "I hope in his last moments he suffered." Archie says "I've changed" to Betty. Veronica walks in, she just moved to town with her mom. Her dad, it sounds like, has been in some kind of scandal. Betty's mom is very controlling, and keeping her drugged to be "focused." This isn't your daddy's Archie. There's a lot of intrigue, and it looks like this murder will be the central mystery of the season. As a new school year begins, the town of Riverdale is reeling from the recent, tragic death of high school golden boy Jason Blossom, and nothing feels the same. Archie Andrews (KJ Apa) is still the all-American teen, but the summer's events made him realize that he wants to pursue a career in music -- not follow in his dad's footsteps--despite the sudden end of his forbidden relationship with Riverdale's young music teacher, Ms. Grundy (Sarah Habel). Which means Archie doesn't have anyone who will mentor him -- certainly not singer Josie McCoy (Ashleigh Murray), who is only focused on her band, the soon-to-be-world-famous Pussycats. It's all weighing heavily on Archie's mind -- as is his fractured friendship with budding writer and fellow classmate Jughead Jones (Cole Sprouse). Meanwhile, girl-next-door Betty Cooper (Lili Reinhart) is anxious to see her crush Archie after being away all summer, but she's not quite ready to reveal her true feelings to him. And Betty's nerves -- which are hardly soothed by her overbearing mother Alice (Mädchen Amick) aren't the only thing holding her back. When a new student, Veronica Lodge (Camila Mendes), arrives in town from New York with her mother Hermione (Marisol Nichols), there's an undeniable spark between her and Archie, even though Veronica doesn't want to risk her new friendship with Betty by making a play for Archie. And then there's Cheryl Blossom (Madelaine Petsch)... Riverdale's Queen Bee is happy to stir up trouble amongst Archie, Betty, and Veronica, but Cheryl is keeping secrets of her own. What, exactly, is she hiding about the mysterious death of her twin brother, Jason? Riverdale may look like a quiet, sleepy town, but there are dangers in the shadows... Based on the characters from Archie Comics, RIVERDALE is from Warner Bros. Television and CBS Television Studios, in association with Berlanti Productions, with executive producers Roberto Aguirre-Sacasa ("Supergirl," "Glee"), Greg Berlanti ("Arrow," "The Flash," "Supergirl," "DC's Legends of Tomorrow"), Sarah Schechter ("Arrow," "The Flash," "Supergirl," "DC's Legends of Tomorrow") and Jon Goldwater (Archie Comics).